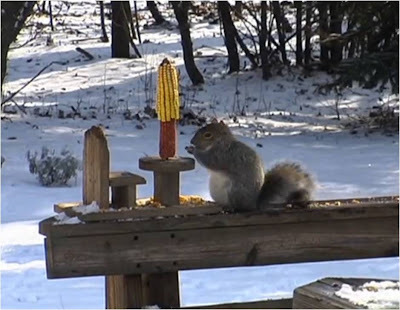 Squirrels + Corn = Video Opportunity. Watch this marvellous time lapse video of a bunch of squirrels (can't just be the same one, surely?) attacking their favorite food of the winter - good and healthy corn straight off the cob! And boy, do they tuck in! The time lapse technique is used wonderfully here and it is fun watching the cob spin around as the squirrels devour it (hence the brilliant name for the piece I guess!). One to watch again and again! This video was made by Vimeo member Mark Svoboda and was shot in an approximately two hour period. As it is produced by Backyard Boredom Pictures, we are assuming that it was shot in Mr Svoboda's back yard - but of course we could be wrong on that point. Wherever it was shot - thank you for a few minutes of great fun!